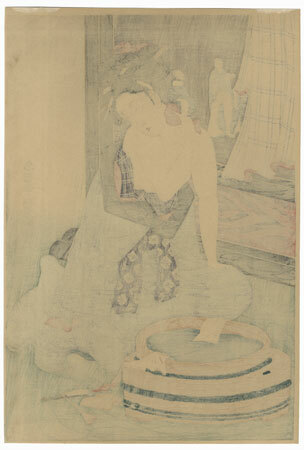 Comments - Beautiful scene of a woman bathing, washing her neck with a red cloth as she leans over a wooden tub full of water. Her kimono hangs over a painted screen beside her, and combs and brushes are scattered on the floor nearby. A classic Edo era beauty subject with wonderful detail and an attractive setting, seldom seen in reprint. Image Size - 15" x 10 1/8"